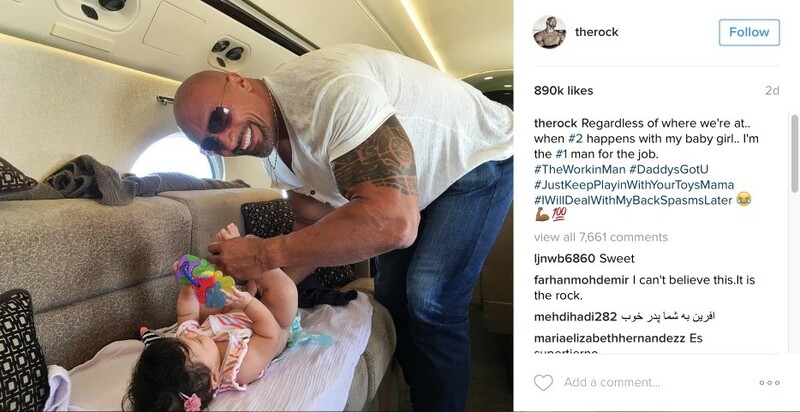 Recently, Dwayne "The Rock" Johnson took to Instagram and posted this smiling photo to give fans a glimpse into his daily daddy duties! He definitely proved that when it comes to his 7-month old daugher Jasmine, #DaddysGotU. “Regardless of where we’re at … when #2 happens with my baby girl … I’m the #1 man for the job,” the 44-year old actor and wrestler told People Magazine. Need more baby care tips and relationship advice? Chat, share, vent, laugh with moms like you on mom.life. Download the app now.